The SEOm Unit Records management page keeps records of all SEO work performed for your clients. It's built to make recording work a fast, organised and integrated process. Have a clear overview of all units in one screen. This central view shows a line by line summary detailing the status, link sources, comments, flags and the manager of each unit. You can easily filter the view to show units by client, date, the type of unit and/or status. Review work done by others, add unit values, add comments and chat with other users. After selecting a client, the system automatically fills much of the information, and provides you with drop-down options plus a list of currently promoted keyword anchor texts. This allows users to add records in just a few seconds. ​Filters allow you to quickly narrow lists to a few records, a tool that is especially useful when you have hundreds of units. The filters allow for easy auditing and reviewing of aspects such as manager performance, unit status, client unit summaries, and more. 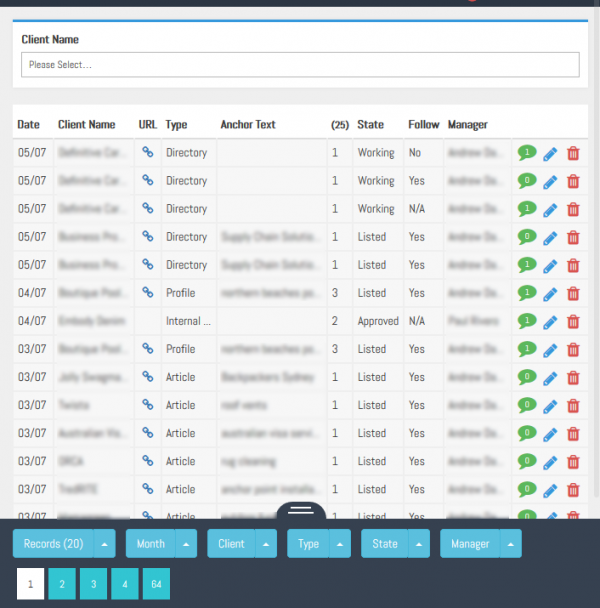 Each record is assigned to a specific client and anchor text. This means that the data from each record can be collated, offering insight into which link sources are most successful and where the future focus should be. The unit value for each record is automatically deducted from the client's budget, ensuring you do not overspend.